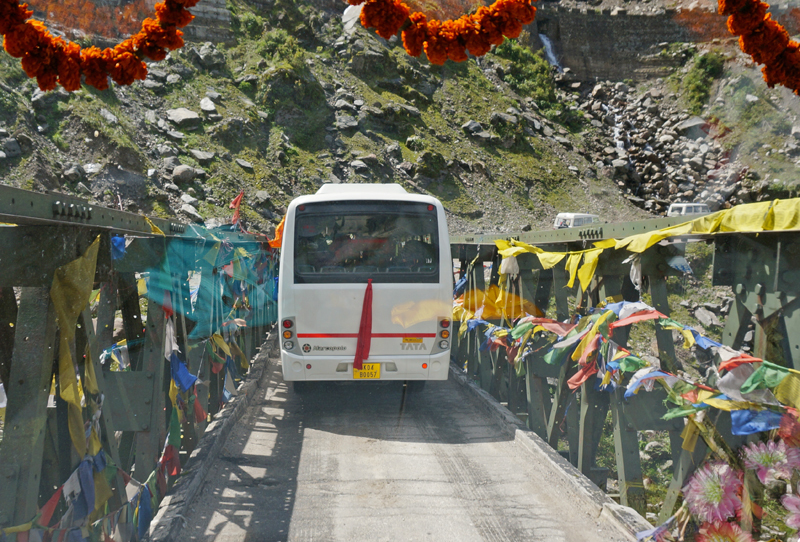 The following post is a part of the “Kailash Mansarovar Yatra” Blog Series Into the Sacred Space. To read complete travel memoirs and trip report, please visit here. As we prepared to depart from Kyongnosla for our next acclimatisation-halt on way to the Nathula, a small herd of yak-cow crossbreeds, called dzo, trooped on the road. Their herdsman was nowhere in sight. In the excitement of spotting something new, Yaks probably, a few pilgrims started taking snapshots of the domesticated animals that appeared half-asleep and disinterested. It was late morning already. Meanwhile, the cooks had assumed complete control over the ration they bought a day before. The entire stock was dutifully packed and weather-proofed in a pickup van which was to transport it to the pass, still a couple of days away. 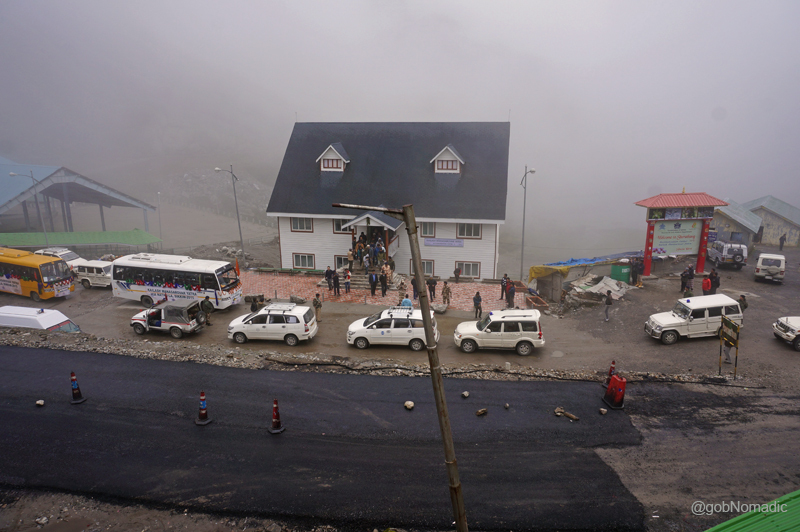 Our next station was Sherathang (4120m), a recently commissioned trading post only six kilometre short of the pass. 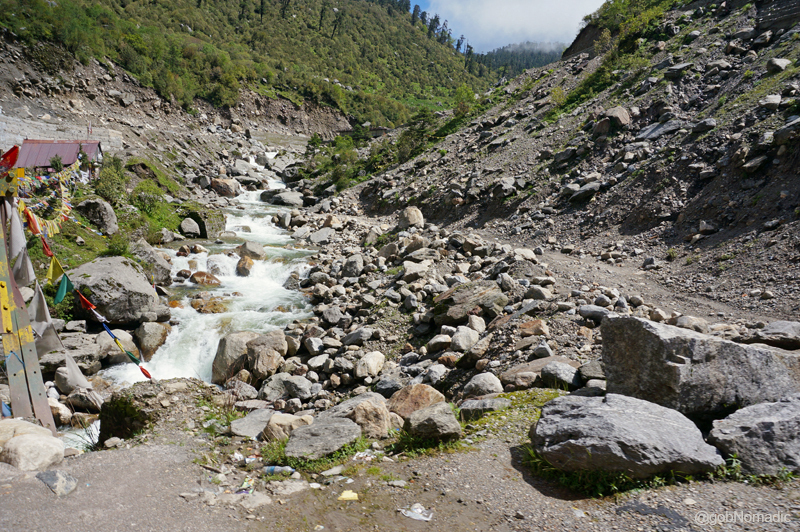 It wasn’t the best of options for acclimatisation on India side of the pass at this altitude but the infrastructure supported our accommodation and wellbeing. As usual babaji initiated the ritual of holy cry of Har Har Mahadeo before we started for the next leg of our journey to the Sacred Space. 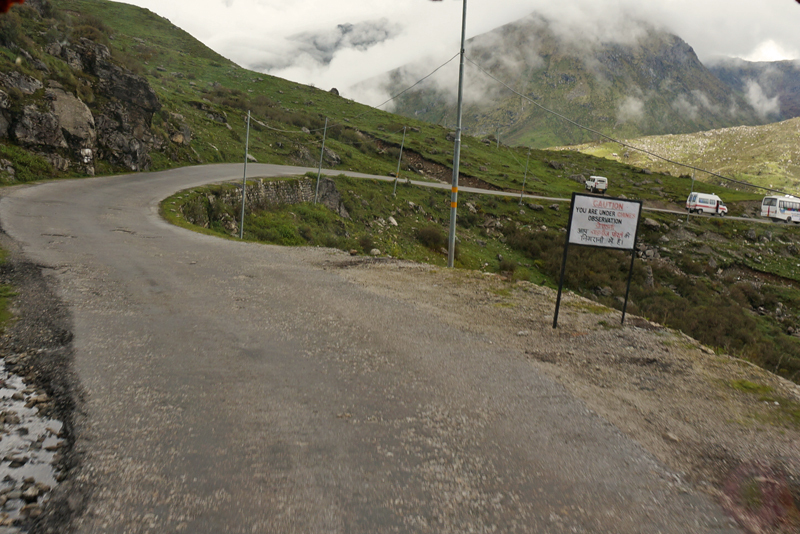 Located at a distance of 26 km from the Fifteenth Mile on the road to the Nathula, Sherathang is otherwise a military check post. It was identified as the site for trade formalities, on India side, between India and China after the route got opened for trading in 2006. Rinchengang is the corresponding location in Tibet. The road ahead was smoothly tarred and broader as compared to the previous stretch. The mountain crests were too close to one another for a long sweeping view besides looking decidedly grim and barren. I decided to give my snap recorder a rest. 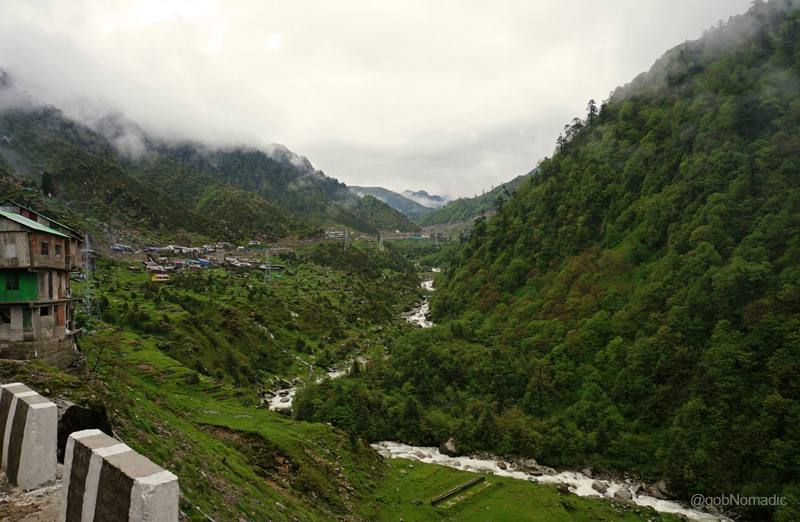 Although Sherathang is positioned above the treeline, there is plenty of moisture and greenery around. The nearby hills were covered with all sorts of shrubbery and wildflowers. 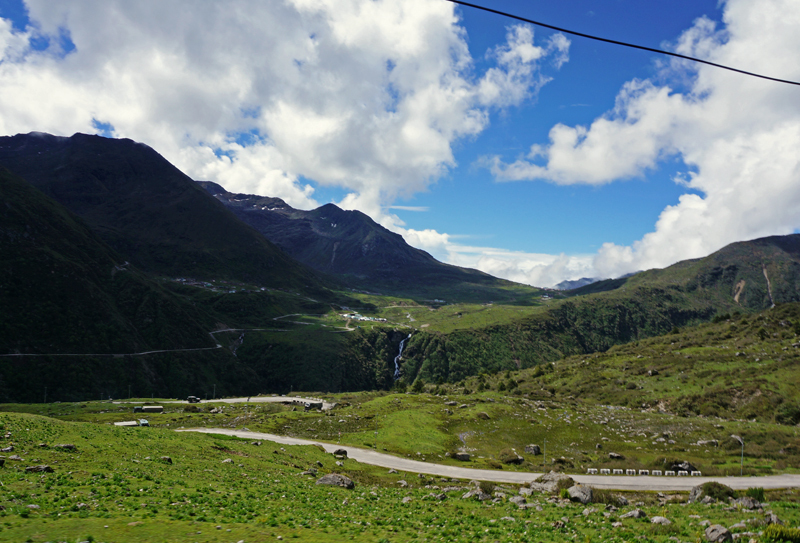 Wedged between the Singalila Range on the west and the Chola Range on the east, the intriguingly moist terrain of Sikkim explains it. The overall alignment – following the east-west orientation, the Great Himalayan Range still further afar to the north – traps the moisture-laden winds coming from the Bay of Bengal. 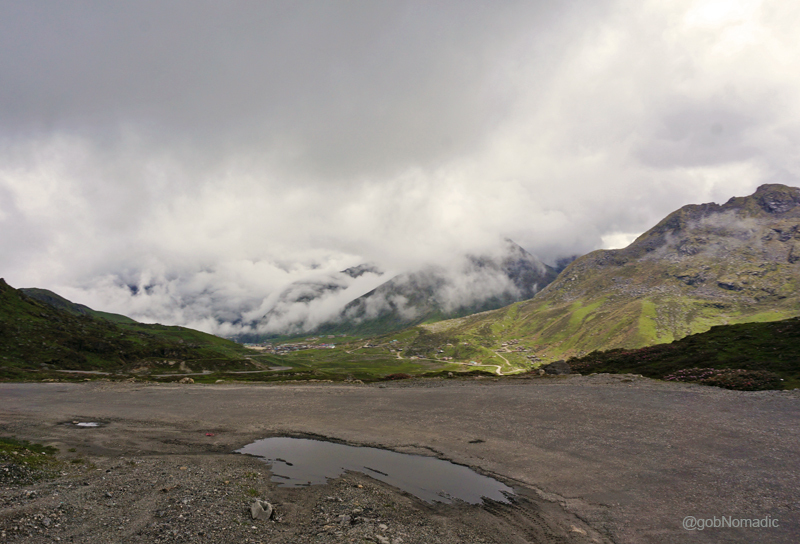 Experiencing an altitude of 4120m on the southern side of the Great Himalayan Range was a first for me. 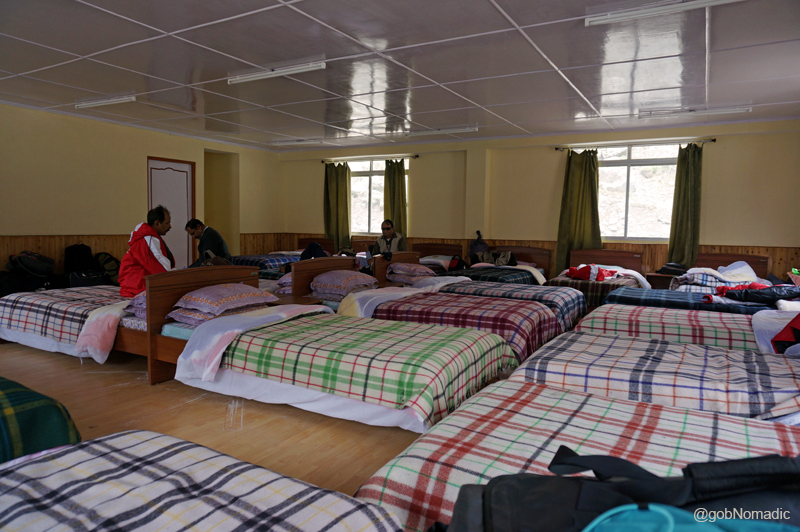 At Sherathang, ten of us were allotted a spacious dormitory for the next couple of days. The rest of the group members were put into separate rooms in the hutment located on the other side of the main road. Both the centres faced each other. The trading mart and its office were situated within a stone’s throw distance from either centre. There is no market to shop or a café to munch here. 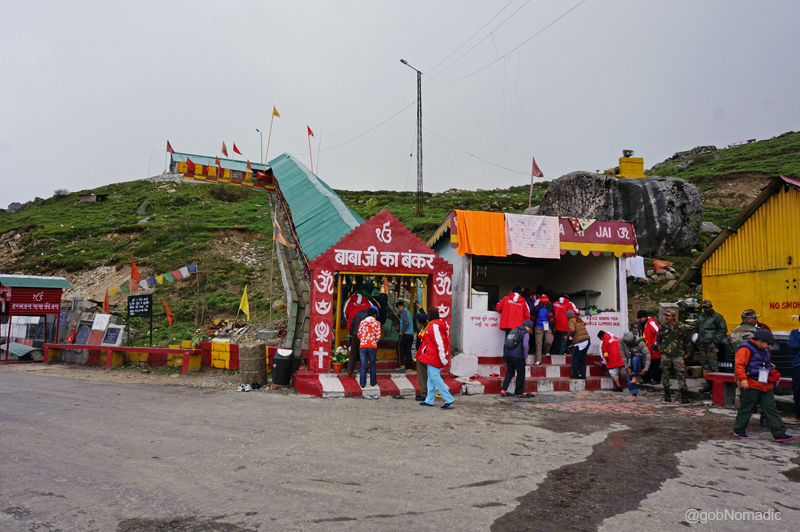 A tin-fabricated temple, looked after by the ITBP, was situated adjacent to the centre. The temple blared Krishna and Shiva bhajans almost throughout the day through its basic PA system. Our dormitory was located on the third floor of the already higher building. The dining hall was at the third basement of the lower building. It was a task, especially for the elderlies, to move between the two locations. 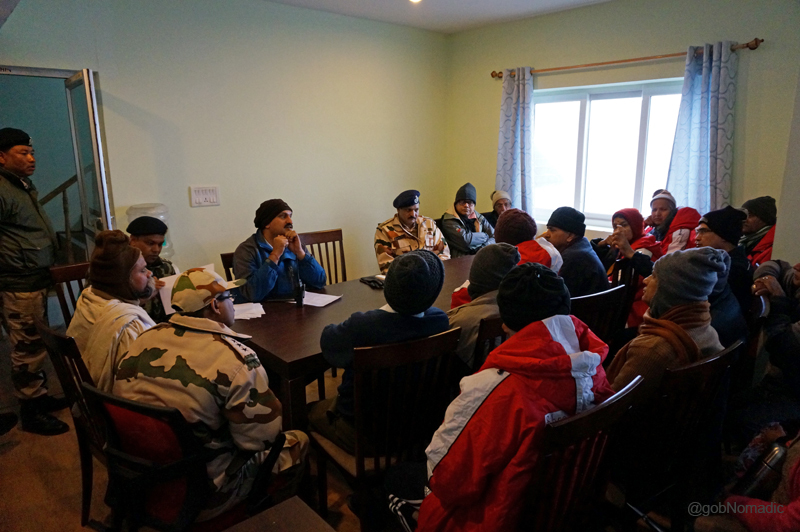 At lunch we were intimated that a medical session, by doctors of the ITBP, will be held in the evening. “The final medical assessment will be held the next evening”, a non-officiating doctor proclaimed even as he put an evil grin on his face. “Those of you who are found unfit will have to go back”, he added impishly. As a result of which, barring a few none looked any further interested in savouring the post-lunch dessert; usually electric-warmed tinned gulabjamuns. The helpless ones started taking an extra dose of medicine to control their fears – mostly related to blood pressure and sugar level. The alarming tone of the doctors had, in fact, amplified the upper blood pressure level in most pilgrims. Having come this far, none of us wanted to be turned back. We were advised total bodily rest at Sherathang. The pretext for immobility here was acclimatisation. Many of the pilgrims were already taking Diamox to prevent altitude sickness. 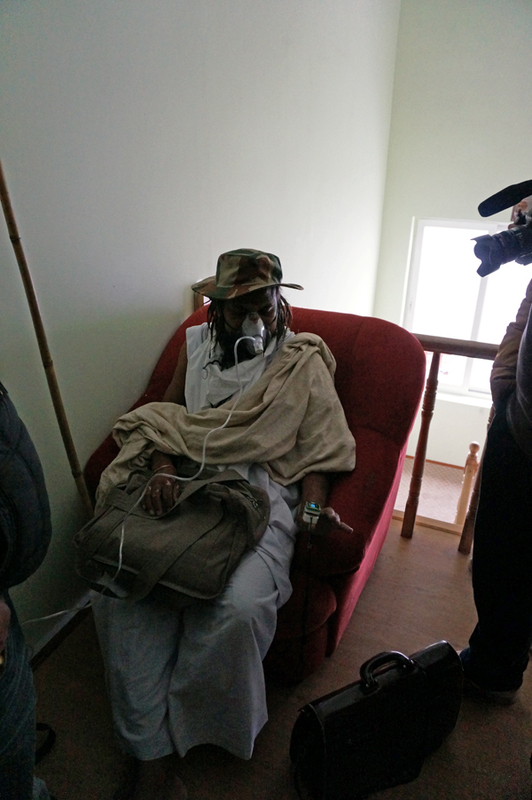 Several were suffering from headaches, nausea and sleeplessness. I continued on my regimen of extra water intake, ginger and garlic to recalibrate my organs with the reduced levels of oxygen in the air. The schedule-induced boredom and stagnancy drove me back into the dormitory at the guest house. I picked up my book again. Even though fully aware that we needed to be patient, it was getting impossible to wait for crossing over to the other side of the pass. With the sun playing hide and seek, it was getting misty outside. Inside, a few of the pilgrims had flogged themselves into a trance of chorus singing. They lined out bhajans with tuneless zealotry celebrating the cult of Lord Shiva. When prodded jocosely over and over, babaji belted out Shri Hanuman Chalisa. Almost everyone chipped in. I was silently observing the proceedings as I updated my travel notes. A kitchen boy walked in to inform the resident-guests that the evening tea was ready along with “pakodas”. People acknowledged with enthusiasm but no one was keen to go all the way down to the dining hall. They continued with their frenzy of reciting shalokas and chants. Having waited for some time and observing that it was turtles all the way down, the kitchen staff had the tea and refreshment sent in the dormitory. Priding themselves for being “notorious” with STDC, the vocalists now gorged on the refreshment until someone reminded them about the evening medical test. I was shooed away when I tried to explain to them an even wider logic of celebrating the natural history of the Himalayas with special reference to the Kailash Mansarovar region. That evening the results of the medical test terrified all of us. Almost all of us reportedly had a higher upper blood pressure level. Much of it was expected at a higher altitude but a lot of it had to do with the real terror, playing in our minds, of being rejected medically. The young doctor, who was in charge of the medical team of ITBP, complimented me after noticing my excellent oxygen saturation level. My BP was still a notch above the normally expected rate; I squarely blamed the anxiety created by the doctors. The medical brouhaha extended till dinner time after which I made a beeline to the ITBP-managed STD, the last practical option, on the road to the Sacred Space, to connect with the real world. I slept peacefully that night. Some of the pilgrims who were on Diamox complained of sleepless the next morning. How could they discount intake of water I told them. 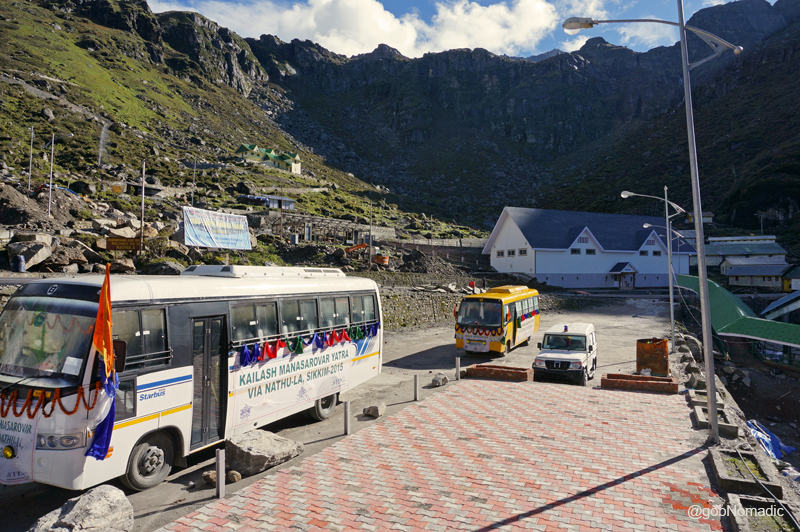 Before I could grumble about boredom to the STDC, seeking some change in routine for the day, the news of visiting the terrain towards Jelepla (4267m) side and the famed Babaji ka Mandir, a shrine dedicated to the solider saint, was already doing the rounds. 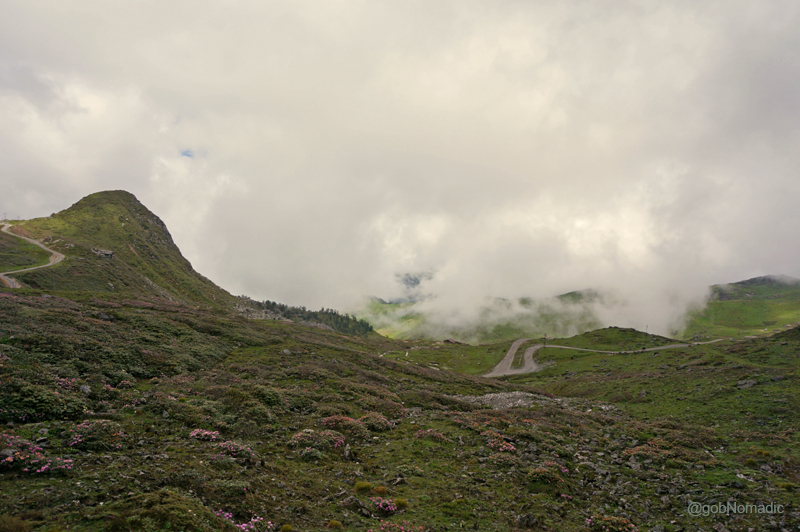 Caressing slopes of the Nathula, the road led us onto a wide open pastureland of Kupup. 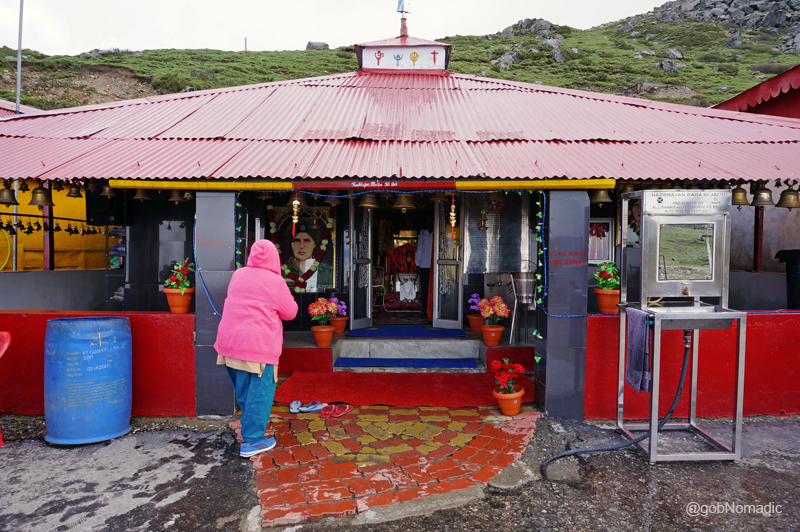 The newer shrine- Baba Mandir – dedicated to the Baba was built at the junction of Kupup Gnathang, the black meadow, road and a trail leading to Menmecho Lake. At the mandir, a modern PA system blared out Sikh gurubanis. 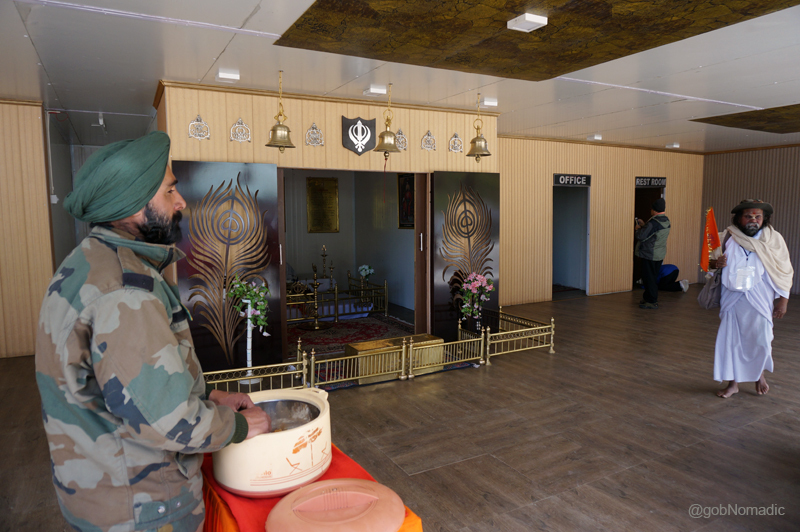 A uniformed Sikh soldier was stationed at the shrine to give prasad to the visitors. 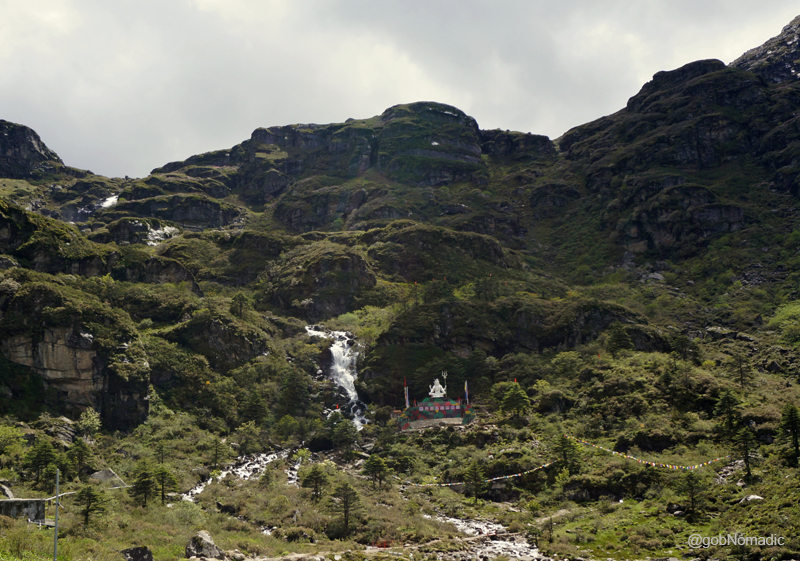 Nearby just below the Namnang Chho waterfalls, the Indian Army has also built a shrine dedicated to Lord Shiva. 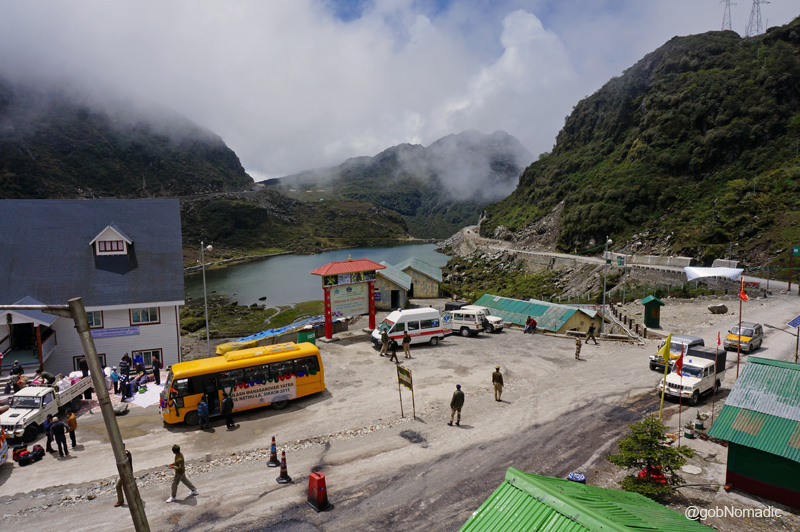 None of us had any idea about the fascinating history behind the locally revered solider saint of Sikkim until the guide initiated us into its story. Baba Harbhajan Singh Ji was an Indian army soldier who died in a weather-related accident on a remote outpost manning the treacherous Indo-Tibetan frontier. In real life, he served with full vigour and dedication. Legend has it that to this day he continues to guard the frontier and assists the soldiers stationed there. He is said to have himself led the search party to the site of his death to help them locate his body. Obliging to his request, which he apparently made in dreams of his fellow soldiers, his Samadhi and a shrine was later raised on the slopes of Tukla where his company was posted. 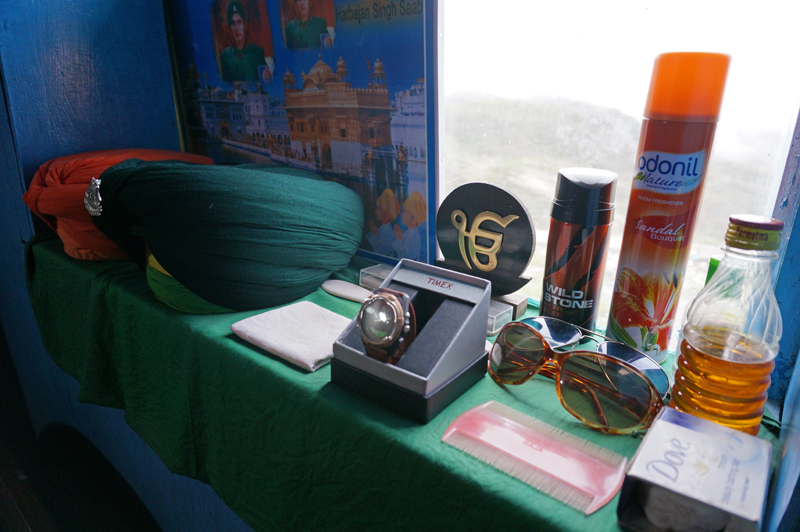 It is claimed that the Baba visits this shrine, an army-bunker almost every night and make use of all his belongings including uniform and beddings after which he dutifully patrols the area. Still drawing his official salary, it is claimed; the departed soldier-turned-invisible-saint answers prayers of those soldiers who seek his help and look for guidance on the battlefield. 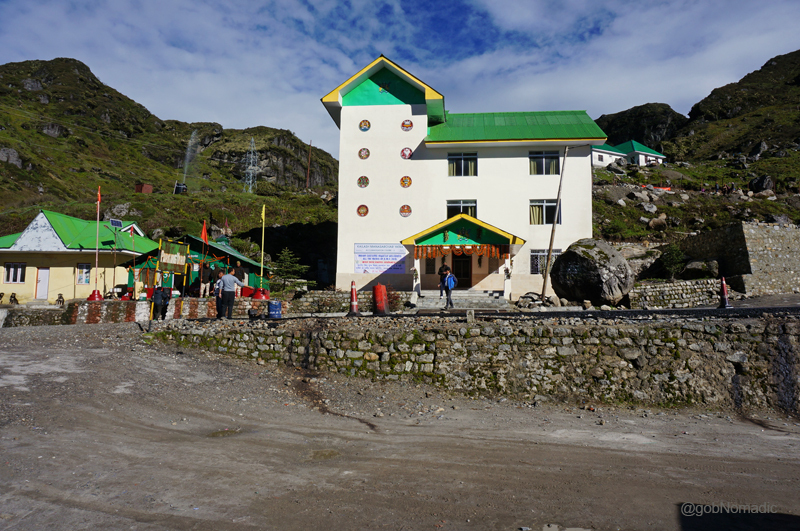 Today, the legend and shrine of Babaji have become a star tourist attraction of East Sikkim. Still misty, the Kupup and Tukla valley terrains were blocked by a cover of cloud. At best I could see some wildflowers and wild rhubarb on the slopes. Driven by curiosity, eyes were fixed on the Chinese army bunkers towards the Jelepla, “The Lovely Level” side where the view was still clear. The landscape encompassing the Kupup Lake, an army golf course, even higher pastureland and an upper valley that led to the Jelepla, once a popular route to crossover to Tibet, made famous by Francis Younghusband to reach Lhasa was visible now. The Kupup camping grounds used to be traders’ first preference for a camping-halt. Many small streams meander down the valley from the slopes; creating a lakelet which gave the traders and now the stationed troops with some recreational means in this otherwise a dreary terrain. Quickly enough we were transported back to Sherathang after the news of arrival of Chinese Ambassador to India trickled in. Back at Sherathang, after the evening tea, our LO handed us a fresh list of items that were banned for entry into Tibet by the Chinese authorities. The arrival of the list basically meant that our cooks and the foods committee had to rearrange the ration. 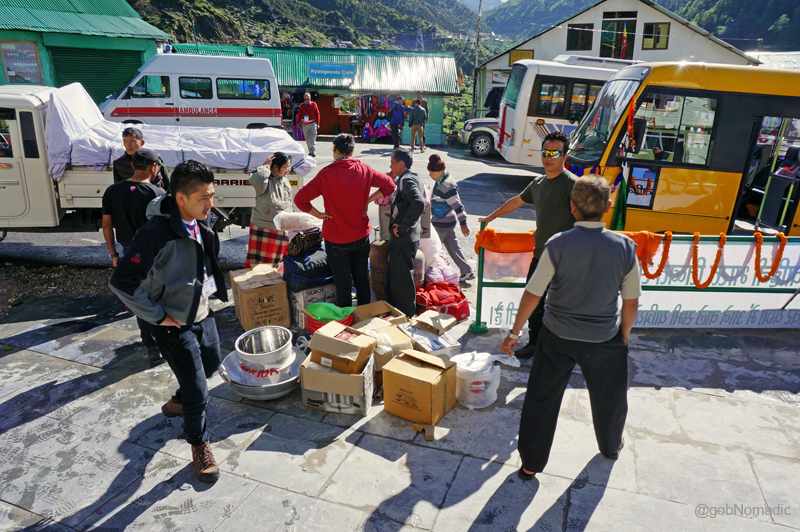 Meanwhile, the finance committee collected dollars from everyone to deposit combined yatra fee to the Chinese authorities, the next day. 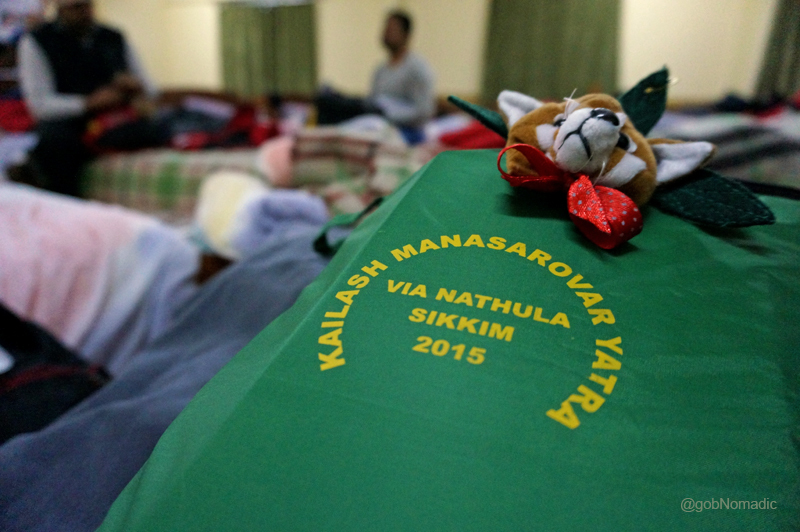 The luggage committee carefully marked the individual baggage that we intended to leave behind at the acclimatisation centre. The STDC had organised currency exchange in the dining hall. Once across the border, only dollars could be used for any currency exchange. 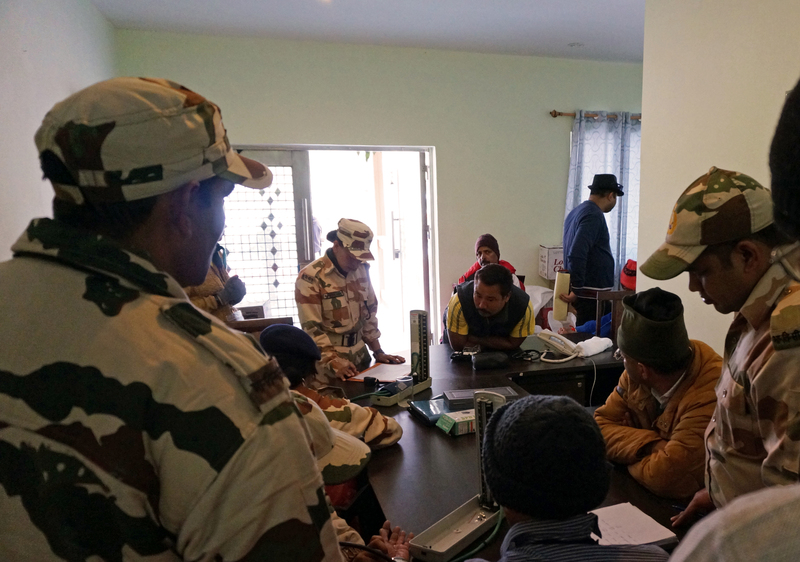 Smartly enough, the medical team of the ITBP organised the final medical check-up without any formal warning which helped curtail our anxiety. I was relieved to see that all of us were declared medically fit for the journey ahead. 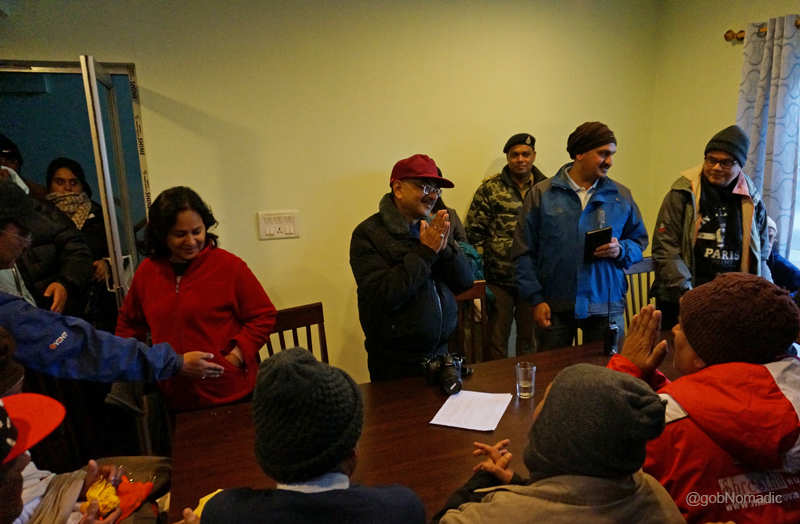 A final briefing session was organised which was attended by regimental heads of the stationed forces, doctors, STDC staff, customs and a surprised visitor Sh Tarun Vijay, Member of Parliament who was to led us for the journey ahead. The customs and immigration people completed most of their formalities after dinner in the dining room itself. The excitement was back in the group. The younger ones gobbled up a rich supply of gulabjamuns before calling it a day. Previous articleThis Appalling Video Shows A Woman’s Ordeal Of Finding A Public Toilet In A City!